Heather Ruark is an American citizen who married a undocumented immigrant. Her story is typical of many families who are deeply impacted by immigration issues. I can still recall the moment I thought I was going to be able to separate my love life from immigration issues. Horacio and I had just started dating, thanks to being introduced to each other by a Colombian couple who were our mutual friends. It was late afternoon and he and I were packing up our picnic lunch at a lake north of Atlanta. As we were getting in his truck, he pulled out his wallet. I think I asked to see his driver’s license photo, which is a pretty innocent (though sometime embarrassing) question among friends with legal immigration status. I guiltily breathed a sigh of relief when he pulled out a valid, current Georgia driver’s license. Don’t get me wrong—I was very interested in him and would have been equally interested had he been unable to produce a valid driver’s license. But possession of a driver’s license surely meant some sort of legal status. Having just finished a year of volunteer work for a nonprofit immigration legal aid agency, and still immersed in immigrant and refugee communities as an elementary school teacher, I knew that meant dating this guy was going to be, shall we say, less…complicated. However, the ensuing conversations during the next minutes and then weeks and finally months led to more details of Horacio’s immigration status. He had once had a tourist visa, but did not have current legal status to be in the States, much less work. He had a couple illegal entries, and from there I started seriously wondering about his possibilities to one day adjust status and become a permanent resident in the States. I began to have a notion that our wonderfully blossoming relationship was at some point going to get…uncomfortably complicated. A year and half after that date at the lake when I popped the driver’s license question, we decided to get married. Along with that decision came the necessity of officially knowing how Horacio’s immigration status would change, or not, with our pending marriage. I checked in with nonprofit immigration law friends to get a recommendation for the best private immigration lawyer in town, hoping for the best. After our consultation and review of Horacio’s immigration documents, we were greeted with the news—we faced a permanent bar to Horacio living in the country legally, and would have to spend 10 years outside the United States before we could even apply for a waiver. Oh dear. We continued on with our wedding plans, and conversations about wedding plans often turned into discussions about how best to deal with our immigration issues. We decided we were definitely going to move to Mexico and possibly a third country soon in order to start the clock on the 10-year wait, hoping to be able to come back to the States sooner than later. It was a painful decision. We were both regularly involved in our respective church communities, we had strong emotional ties to two dear groups of friends that met on a weekly basis, I loved my job as a first grade teacher at an international school, and we spent major holidays with my family. However, it was one of those few decisions in life that are starkly black and white. If we stayed in the States, my husband had no chance of legal status and in fact, had a chance of being deported. If we moved abroad, at least the clock would start ticking down to the day when we could return to the only life we knew as a couple. We ended up choosing to wait until about a year after we had married, in order to save up money and avoid inflicting major life changes upon ourselves in addition to adjusting to married life. I am not sure which date is seared more deeply in my mind … July 2005 when we tied the knot or October 2006 when we crossed into Mexico and began the real journey that has tested how strong that knot is. I remember driving across the bridge from Texas into Mexico, life suddenly switching to slow motion, and thinking everything about us changes now. Everything about us as a couple is suddenly … incredibly complicated. Over the past six and a half years I have been able to get to know Horacio’s family better. We have been able to celebrate his nieces’ and nephews’ birthdays and baptisms, accompany his parents on their 50th wedding anniversary, and learn more about the culture and customs of Horacio’s home country. However, for every birthday celebrated here in Mexico there is one I miss in the States, and every wedding here is a wedding I was unable to attend in the States. Even when we baptized our first son, none of my family was able to attend, and our son’s godparents chose to risk their health and fly down from Atlanta during the H1N1 flu outbreak in order to accompany us. 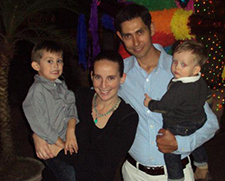 In fact, it is since becoming parents that Horacio’s lack of legal remedy is more painful. Our four-year-old can recite on demand the explanation that “Daddy doesn’t have a United States passport or a special card or paper that will let him into the United States.” Some days, he says he is going to make his daddy a special paper so that he can travel with us. If only it were that simple. Every summer I have to choose to either take our sons to visit my parents, siblings, and grandmother, or celebrate my husband’s birthday. This may not sound like a big deal, but I haven’t celebrated my husband’s birthday in person since 2008. My son has had to celebrate every one of his dad’s birthdays on Skype. Every Christmas we have to decide whether to spend it with Horacio and his family or with my family in the States, and every December it’s a struggle to make that decision. With two kids now, the decision is made by financial needs, and more often than not, we stay in Mexico. I have not celebrated Thanksgiving with my family since 2005, and my children have yet to have a real Thanksgiving. Holidays are always a painful issue when separation of any sort is involved. However, holidays are only a part of the larger culture that my sons are missing. I realize this more with my older son in random comments he makes. One day he responded to me in Spanish, and I told him to please talk to me in English. He replied, “But Mommy, Spanish is easier for me.” While I am thrilled to have a bilingual child, I sometimes worry about how long that will last. Despite the fact that I speak only English to him, I am the only native speaker he talks with. Whenever there is a soccer game on TV, he always wants to make sure he is cheering for the Mexican side. While this may be cute, it does tell me that he does not feel like he is from the United States, which is perfectly normal. He does not live there, and two or three weeks a year is not going to make him feel American. On rough days, I daydream about moving back north with our two kids and working for a year or so. Then I snap back to reality and chide myself for even considering separating our sons from their dad for more than a summer vacation, shocked that I would even allow myself to ponder a long distance relationship with a husband I love deeply and enjoy spending time with on a daily basis. There is only one situation in which long distance marriage would ever be an option for us, and that relates to the issue of personal security. It is no secret that Mexico is plagued by drug violence and organized crime. I perhaps sugarcoat news or avoid sharing it altogether in order not to worry family and friends back home. However, Horacio and I have a clearly laid out “Plan B.” Should violence escalate to the point in which our children’s lives are clearly in danger, I would immediately move back to the States with our sons and we would begin to work on a third country to meet in. Fortunately, we are not at that point yet, but there are an alarming number of precautions we now take. When we travel by car the six hours to Horacio’s parents and sisters’ homes, we only travel during the day and there are certain rest stops we no longer break at because of their reputation. Just two years ago, my sister-in-law and her family were carjacked, and we are constantly aware that this is a possibility. Whenever we travel more than an hour from our home, I always carry my passport and our sons’ passports, just in case. In public places, I keep my son close by, morbidly worrying about kidnapping. When we are at my in-laws’ home over holidays, we rarely leave their house, and for good reason. There was a shoot out in broad day light at a nearby grocery store the weekend before Christmas. Two days before Christmas, mass at the church one block from my in-laws house was canceled because the priest had been assaulted and carjacked. The priest. I struggle a lot with anger. Why should I have to decide between my children’s personal safety and keeping my family together? Shouldn’t I be able to live with my husband, to keep my children with their loving father, but also be able to live in my home country and culture? Shouldn’t my children be able to grow up close to my family and know my culture as well without being separated from their father? If the permanent bar were struck down, we would be the first in line to adjust my husband’s status and return to the life that we left in the States over six years ago. In my Facebook status update last fall, I depressingly wrote, “Six down, four more to go.” I was surprised to see the number of people who understood the reference. With immigration reform in the news, I hope more of the public could understand such a post. Keeping families together should not be this painfully complicated. It should not be about counting down the years, but rather, as soon as possible, families like mine should able to announce, “We’re coming home—all four of us—together!” _______________________________________________________________________________ Heather Ruark is currently a teacher at a bilingual elementary school in Queretaro, Mexico. Please note that the views expressed do not necessarily represent those of everyone associated with G92 or any institutions with which the blogger may be affiliated. We’re always looking for new guest bloggers; please check out our Guest Blog Submission Guidelines if you’re interested. I just want to say thank You for being an strong, full of Love and Sacrifice Human being… You are a great strong lovely person and I wish the best for You and your Family, for everything You’ve done You are a great example of what Love means… God with You… stay strong.